I have come to work at a bar experiencing a daily variety of paranormal experiences. 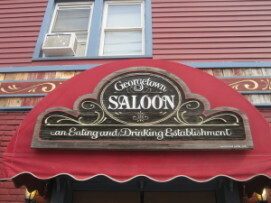 The staff and locals at The Georgetown Saloon strongly feel that the ghost of a gentleman named Kurt, a one eyed former resident of the apartments above the saloon, has continued his daily visits from beyond the grave. Kurt is mostly a prankster and likes hiding things. He has also been known to toss a few things around the restaurant.The Saloon's neon bar sign is broken but on occasion suddenly illuminates fully, which patrons have taken as a sign that Kurt is hanging out in the bar. There isn't a day you can't stop by the bar and hear about someone's experience so I encourage you to drop by anytime. If anyone is interested in investigating, I'd love to hear from you.